The domestic cat commonly known as a ‘moggie’ is the most common cat living in households across the UK. This is a cat of no particular breed and has descended from the Afican Wildcat having diverged around 8,000 BC and found in almost every place where humans live. 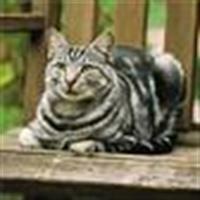 Some breeds are predisposed to certain personality traits but moggies have no such blueprint, through their random breeding they do not have a definite appearance or temperament. They have independent personalities and come in a variety of coat and colour. All cats require grooming but due to the short-hair gene, most moggies don’t require much in the way of grooming -- except, of course, from the odd brushing to cut down on hairballs. A moggy is definitely the kind of low-maintenance cat who enjoy people and will happily follow their owners around the house. They make ideal pets for families as they are with a person living on their own … they are all truly unique!